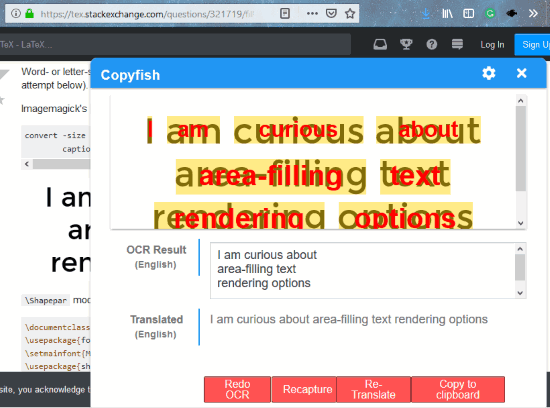 In this blog post, you will know about how to copy text Image in Firefox using free OCR add-ons. Here, I cover 3 Firefox add-ons. All these add-ons work in different ways. The very first one named Copy Image Text is a very simple and quick way to copy text from image. All you have to do is click right on the image and click on Copy Image Text. This way, you can copy the image text to clipboard. Whereas in the second add-on called Image Reader (OCR), you need to browse image from your PC in order to extract text from image. And the third one lets you capture the image text so that it can extract text from images. In order to extract image text, you usually retype the content/text that the image contains. But with the help of these add-ons, you can easily copy the long text without making any efforts to type on your Computer. These add-ons work as an OCR software which reads and takes out all text from the image. Let’s read about each add-on to copy text from Images. As the name suggests, Copy Image Text is a Firefox add-on to copy text from Image. The add-on is simple to use. Once it is installed, you might not know how to use this add-on as no icon appears in the toolbar. In order to copy text from Image, you need to click right on the Image. As you can see in the image above, there is an image that contains text. Then, I clicked right on the image, it showed options like View image, Copy image, Copy Image Location, etc. You can click on the last option “Copy Image Text”. Thereafter, the text from the image will be copied to the clipboard. Doing so, you don’t need to type the image text. With the help of this add-on, you can easily copy the text from Images. 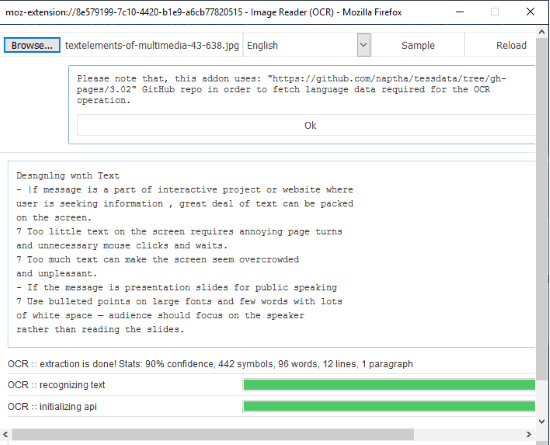 Image Reader (OCR) is another free Firefox add-on to copy text from Image. This add-on is a bit different than the above-mentioned add-on. It reads images and provides text in more than 60 languages. When you install the add-on, an icon appears in the toolbar. This add-on does not work on online images. To save the image text, you have to click the add-on icon. Thereafter, an interface opens up where you have to browse the image from your PC. Then, this add-on recognizes and extracts text from the image. You can copy the text to clipboard. Until now you were reading about the images readers. Copyfish is a bit advanced than aforementioned add-ons. Using this add-on, you can copy text from Images, Videos, and PDF. The add-on works like OCR software. Once Copyfish Firefox add-on is installed, a black fish icon appears in the toolbar. In order to save image text, you don’t need to browse the image from your PC. All you need to do is to open an image and then click on the fish icon. Thereafter, you can capture the text of the image. You can see in the image above that how this add-on showed the text from the image. Also, it is showing the result in OCR and then the Translated result. If you wish to have more features then read this article to get 5 free OCR software. With the help of these add-ons, you can easily copy text from images. Now you don’t need to type the whole image text, just using Firefox add-ons will make your work easier. You may give it a try and extract long text from images.